Sponsored by Werther’s Original. 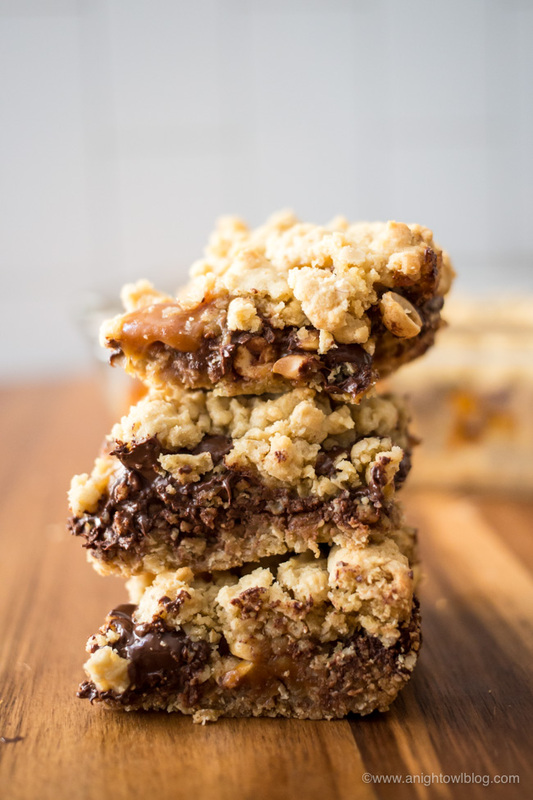 Stuffed with Werther’s Soft Caramels, peanuts and chocolate chips, you’re going to drool over these Stuffed Caramel Chocolate Chip Cookie Bars! Hi friends! Did you know that today, Thursday, April 5th, is National Caramel Day? It’s certainly a day to celebrate in my book. And you know how I think we should celebrate? With some Werther’s Original Caramels! Available at retailers nationwide, Werther’s Original has a caramel flavor for everyone and every occasion: from caramel classics such as hard, chewy, soft, creamy filled, sugar free and caramel popcorn to caramel flavor combinations including apple, coffee, cocoa and vanilla. 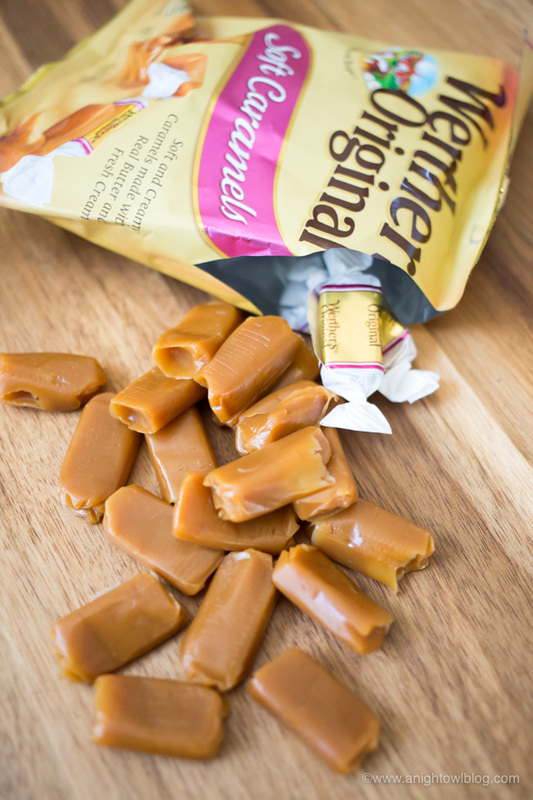 And for this occasion, we’ve even whipped up a special recipe using Werther’s Original Soft Caramels. 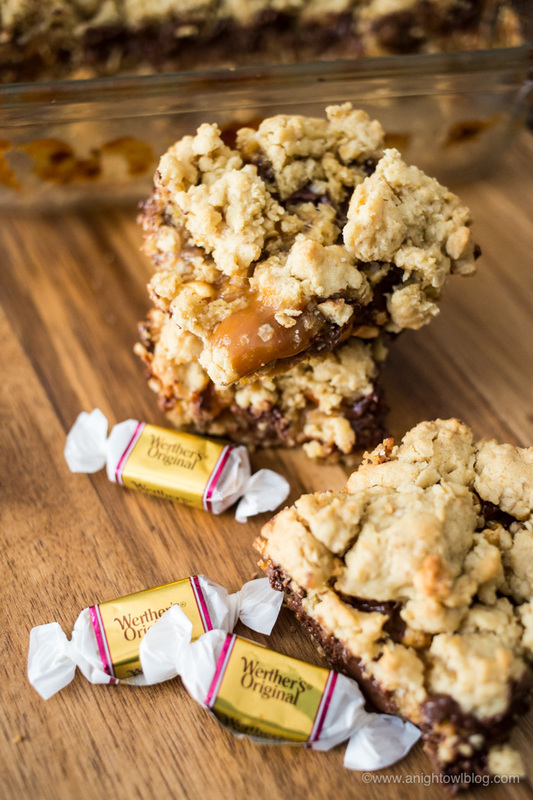 We took a delicious Chocolate Chip Bars Recipe and stuffed them with Werther’s Original Soft Caramels, chocolate chips and peanuts for some amazing Stuffed Caramel Chocolate Chip Cookie Bars! In celebration of National Caramel Day, Werther’s Original is teaming up with Hasbro’s classic game CANDY LAND. Together, they will create CANDY LAND: The Werther’s Caramel Edition Game, a life-sized game board that will pop-up for one-day only on Santa Monica Pier. How fun is that?! Caramel lovers can celebrate National Caramel Day by taking a sweet journey down a caramel path through four tasty lands in CANDY LAND: The Werther’s Caramel Edition Game. The life-sized game board is filled with caramel loaded fun and designed with the original CANDY LAND theme. Game players can adventure through the Caramel Popcorn Mountains, snap photos in the Werther’s Woods, fish for caramel treats in the Caramel Crème Lagoon and enjoy their favorite Werther’s Original sweets at the Caramel Castle. Not in Santa Monica? No problem! Caramel lovers nationwide can experience CANDY LAND: The Werther’s Caramel Edition Game online by visiting CaramelDay.com. This digital destination features an online version of the life- sized game board, allowing users to learn Werther’s Original fun facts as they explore different caramel regions. 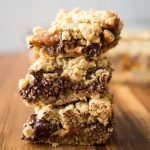 We’ll be celebrating the food holiday at CaramelDay.com and with this tasty Stuffed Caramel Chocolate Chip Cookie Bars recipe! 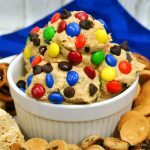 We’re going to start with one of my favorites, oatmeal cookie dough. In your mixer, cream together butter, sugar and brown sugar then add in your eggs and vanilla until combined. Then add in your flour, oatmeal, salt, baking powder and baking soda. This will result in a delicious crumby oatmeal cookie batter. Press half of that dough in a greased 8×8 baking pan and pop that into a preheated 350 degree oven. Bake for 15 minutes and then remove from the oven. That’s when you’re going to add the magic. 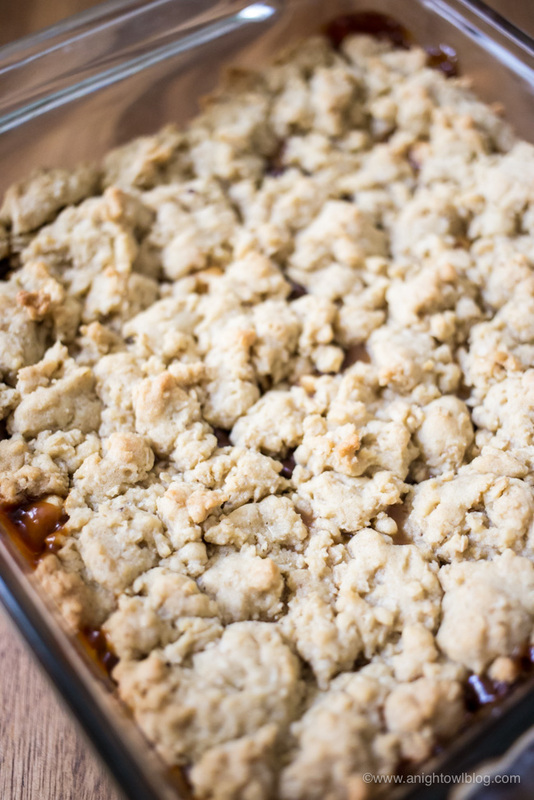 Top the baked dough with chopped Werther’s Soft Caramels, chocolate chips and nuts. In this case we added peanuts, but pecans or walnuts (or no nuts if you’d prefer) would be as equally yummy. Then top the caramel and chocolate layer with the rest of your crumbly cookie dough. There’s no need to spread as the caramel and chocolate layer will melt in the oven and the cookie dough will cover. 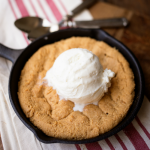 Bake for 20 additional minutes or until the top layer of cookie dough is done! At this point you can scrape the sides of the bars so that they don’t stick to the pan, but let the bars cool fully before cutting. Once they’re cooled, you’re going to want to break right into these delicious Stuffed Caramel Chocolate Chip Cookie Bars! So are you ready to celebrate with me? Join the Werther’s Original National Caramel Day conversation on social by following hashtag #WerthersXCandyLand and enter to win exclusive caramel product giveaways by following Werther’s Original on Facebook, Twitter and Instagram. Can’t wait to see how you plan to celebrate National Caramel Day! 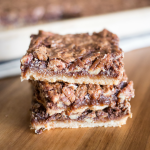 Stuffed with Werther's Soft Caramels, peanuts and chocolate chips, you're going to drool over these Stuffed Caramel Chocolate Chip Cookie Bars! Preheat oven to 350 degrees and grease an 8x8 pan. In a mixer, cream together butter, sugar and brown sugar. Add in your eggs and vanilla until combined. Then add in flour, oatmeal, salt, baking powder and baking soda and mix until dough forms. 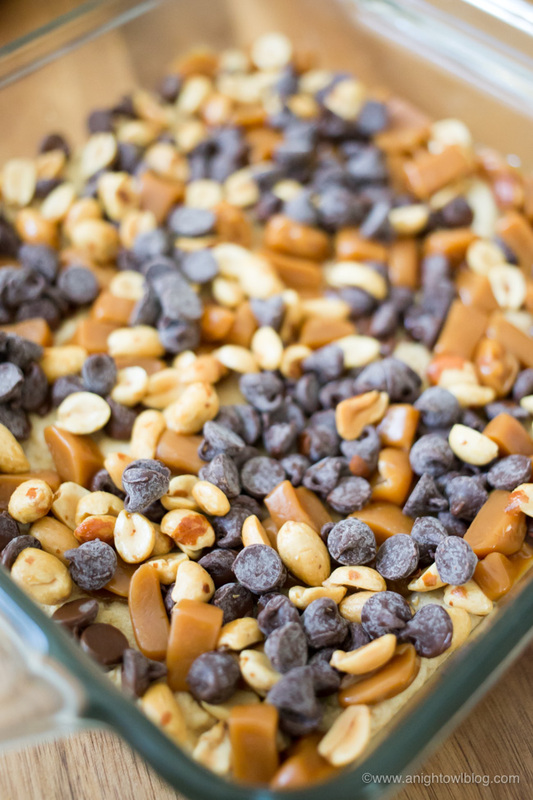 Remove from oven and top with chopped caramels, chocolate chips and nuts. Top caramel chocolate layer with remaining cookie dough. Bake for 20 additional minutes or until the top layer of cookie dough is done! 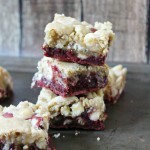 These look Delish!!! I am going to make them today as I actually just bought DH a few bags of these the other day!! Thank You! !